In this week's Budget announcement, the long-suspected upcoming GST hike from 7 per cent to 9 per cent is dominating coffeeshop discussions. But the one tax announcement that will affect Singaporeans earlier than expected is the GST on imported digital services. This will kick in from January 1, 2020 and it affects almost every aspect of Singaporean lives. Watching movies on Netflix? You'll have to pay GST. Listening to music on Spotify? Pay GST. Download an app on Google Play or the Apple App Store? Pay GST. Buy a Loot Box in Overwatch? Yep, you guessed it - pay GST. As you can tell, the list is not exhaustive. Software platforms like Steam, streaming services like the WWE Network, online games with microtransactions like Overwatch Loot Boxes, music and videos that you buy or rent on iTunes, even buying Skype Credits are probably going to incur GST by 2020. Even private-hire services like mobile app Uber, which currently does not charge GST, may be affected, since they may be considered "digital services". Until we have more information, it's anyone's guess what else might be included in this list. It may help to see what the definition of "digital services" are in countries where this tax has already been implemented. In the European Union, "digital services" even includes e-books such as those you buy for Amazon Kindles. Ironically, physical books in the EU are subjected to reduced taxes, such as 0 per cent in the UK and 7 per cent in Germany. E-books, on the other hand, are subject to taxes as high as 20 per cent in the UK and 19 per cent in Germany. In Australia, the GST rate of 10 per cent was extended to all digital services in July 2017. This includes digital newspapers, membership fees of online clubs and dating services. So if you're using a ticketing service like Eventbrite for an event in Melbourne, you will be charged 10 per cent GST. Interestingly, buying Bitcoin in Australia no longer incurs a GST charge. In Japan, the Consumption Tax of 8 per cent has applied to digital services since October 2015. This includes e-books, cloud-based services, apps, streaming media and online gaming. Interestingly, voice and data telephony services are excluded. What we've named so far are businesses that sell services to consumers directly. It's estimated that there are only about 100 businesses that meet the criteria for GST. The criteria are: annual global turnover of more than S$1 million and sale of digital services to customers in Singapore of more than $100,000. However, you then have to consider businesses that sell services to other businesses. All sorts of cloud-based functions are now available, for example, from sales to human resources. It's estimated that there about 1,000 of these businesses in this category that will start charging GST. This means that the costs could be passed on to you, the consumer. The rise of casual gaming has enshrined the concept of microtransactions. This is because most popular casual games like Candy Crush Saga are free-to-play, but earn money from players who spend a bit of money on getting extra moves, extra lives and other In-App Purchases to enhance your gameplay. However, with some multiplayer games, this can lead to the concept of "pay-to-win". This means that the more money someone spends on In-App Purchases, the more unbeatable they become. Players that don't spend money will find get frustrated that they cannot compete against such players. Fortunately, some game publishers successfully manage to balance paying and non-paying players as fairly as possible. Overwatch is a popular multiplayer first-person shooter game from Blizzard Entertainment. In Overwatch, you can obtain Loot Boxes through gameplay or just by paying. Because of the random nature of the Loot Boxes, paying and non-paying players have the same chance of obtaining items, whether it is during game events or otherwise. Paying players therefore have no discernible advantage over a non-paying player. Once GST kicks in, therefore, you'd probably find Overwatch players thinking twice about paying an extra $2 for a pack of 24 Loot Boxes. $2 may not seem like a lot, but to an Overwatch player, that extra $2 could have been used to buy another Loot Box. If nothing else, the implementation of GST on digital services will lead to less "pay-to-win" players from Singapore. A small victory for non-paying gamers. SO WHAT CAN SINGAPOREANS DO AHEAD OF GST BEING IMPLEMENTED IN JANUARY 1, 2020? Start paying attention to how much your online subscription services are costing you. Individually, they may not cost more than $20 each a month. But, if you're just spending $70 a month on them, that's another $5 you'll soon be paying a month in GST, or $60 in a year! 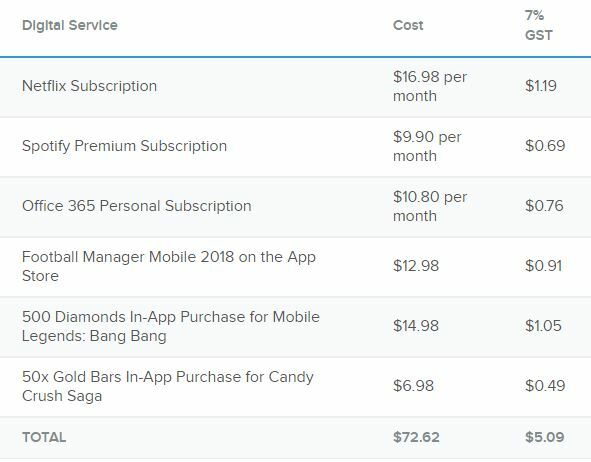 It may be time to finally decide which subscriptions are worth paying for, and which aren't. If you have a habit of buying lots of In-App Purchases for your games, think twice. If your preferred game is anything like Overwatch, it might be a good idea to start spending a bit more time in-game to earn Loot Boxes rather than just buying your favourite hero's new skin. And if your game is purely "pay-to-win", perhaps just give up on it altogether. On the other hand, we know we'll never give up our Netflix and Spotify Premium subscriptions, so make sure you're charging it to an online shopping credit card. Apply for the DBS Live Fresh card and get 5 per cent cashback rebates on online spend. It won't offset GST entirely, but it's a start. Remember, GST will increase from 7 per cent to 9 per cent soon after! Maybe it's time to start hanging out in coffeeshops instead.